NYC Bicyclist advocates are warning that a fatal bike accident may occur if nothing is done to address safety on the Kent Ave bike lane in Williamsburg, Brooklyn, NYC. The lane is constantly clogged with cars and construction vehicles forcing bicyclists to dangerously veer back and fourth into traffic. 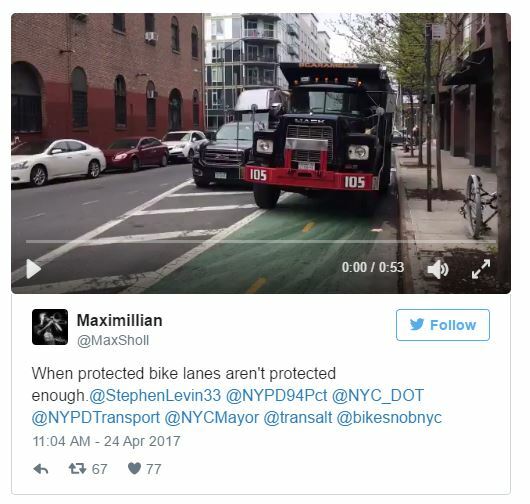 A recent video (click on the picture to access video) on Twitter by Transportation Alternative Advocate Maximillian Sholl shows traffic of trucks and cars casually driving on the protected bike lane forcing cyclists to ride on the sidewalk. Out of the 319 complaints about blocked bike lanes that have been reported to the 311 number since last November when this service was created, 19 were related to clogging on the Kent Ave protected bike lane. This dangerous situation comes from high traffic activity generated by dozens of waterfront construction sites. According to bicyclists some of the construction sites are very respectful of bicyclist safety while others don’t really care. Fore example the Domino Factory construction site has workers sweeping the bike lane regularly and workers are flagging the traffic to give bicyclists the right of way. Things are different with the 420 Kent Ave construction site. The bike lane in front of the construction site is often obstructed by trucks. Workers who are supposed to flag traffic don’t do it and sometimes curse at bicyclists. According to bicyclists commuting daily on the bike lane, the situation is only getting worse. Bicyclists have tried to flag down police cars to ticket badly parked vehicles but were laughed at. Parents bringing their child to school have complained about street safety in the same area as well. Last December a pedestrian died on Kent Ave after being dragged under a truck. Is the city waiting for a bicyclist to die before doing something about this worrisome situation ?